Searching for a new San Jose eye doctor? You are at the right place. We care for patients in the San Jose area and for those all over the Bay Area. Our philosophy is to provide personal and friendly eye care, in a comfortable setting, with sufficient time for questions and answers, using advanced technology and diagnostic skills, excellent medical and surgical management, and superior service. Dr. Saub is Board Certified by the American Board of Ophthalmology. He trained at Stanford University and he is on staff at Good Samaritan Hospital. He is a former surgical instructor for Stanford Residents and he is a former Chief of Ophthalmology at Community Hospital of Los Gatos. Dr. Saub collaborates with many doctors of various specialties throughout the Bay Area and with those at USCF and Stanford. South Bay Ophthalmology has grown in many ways, including this new website that features a substantial Patient Education Center, online appointment requests and online forms. We also have a Patient Web Portal that offers Secure Messaging directly with Dr. Saub. We recently added a link to EyeSmart™ a public awareness campaign that empowers Americans to take charge of their eye health. Click on the logo to the right to explore a vast resource. It includes information about risk factors for eye diseases, infections and injuries, and the role ophthalmologists play in the prevention, diagnosis and treatment of eye conditions. The campaign is sponsored by the American Academy of Ophthalmology, in partnership with EyeCare America—a public service program of the Foundation of the American Academy of Ophthalmology. The practice has expanded in other ways, too. We are now in a larger suite where we offer a full service Optical Shop that features the latest in lens and frame technologies yet offers pricing for most budgets..
Our office uses electronic medical records and electronic medical prescriptions. Your private information is never shared without your permission nor is it stored in the cloud. We also provide secure HIPPA-compliant online access to your eye exam records via my Patient Portal at https://secure.myeyecarerecords.com. Once registered, you can securely view, download and transmit your eye records to your computer or another medical provider. Secure messaging with Dr. Saub is also available through the Patient Portal. In keeping up with the latest diagnostic technology, we recently added the latest OCT technology in diagnosing and managing glaucoma, macular degeneration and other retinal diseases and optic neuropathies. I want to thank my patients and colleagues for the many referrals that have contributed to our growth. We schedule appointments to allow sufficient time to get to know you and for you to get to know us. We believe that taking time to answer your questions and to have a meaningful exchange is important to you and your healthcare. To view the Quiz need to download the free Adobe Flash Player. Make sure children have appropriate supervision when playing with potentially hazardous toys or games that could cause injury. If you plan to give sports equipment, provide appropriate protective eyewear with polycarbonate lenses. Check with your local Eye M.D. to learn about protective gear recommended for your child's sport. Check labels for age recommendations and be sure to select gifts that are appropriate for a child’s age and maturity. The branches and needles of Christmas trees can be hazardous to the eyes, so be especially careful when untying your tree. The branches can burst forward, hitting and injuring your eyes. Glass ornaments should be hung out of a child’s reach to avoid potential injury. Cataract—clouding of the eye's lens. Cataracts develop at an earlier age in people with diabetes. What is a cataract? A cataract is a clouding of the normally clear lens of the eye. It can be compared to a window that is frosted or yellowed. The amount and pattern of the cloudiness within the lens can vary. 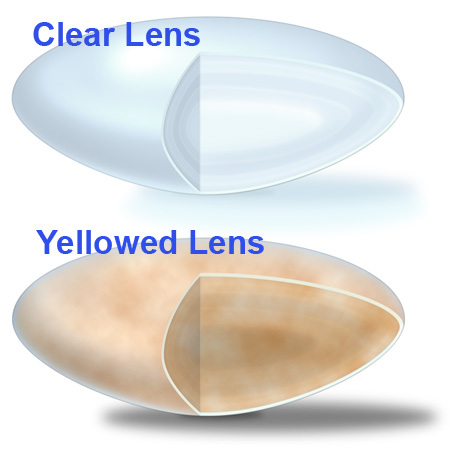 If the cloudiness is not near the center of the lens, you may not be aware that a cataract is present.